I really have a thing for Chinese dim sum! Whether they’re delicately steamed or deep fried, I love them all. 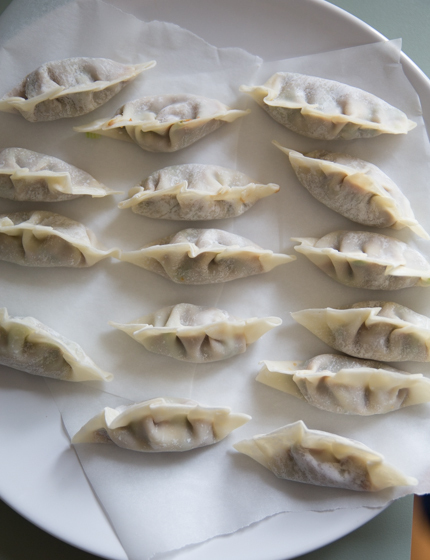 Dumplings are great, but they’re a real pain to make – or so I thought. 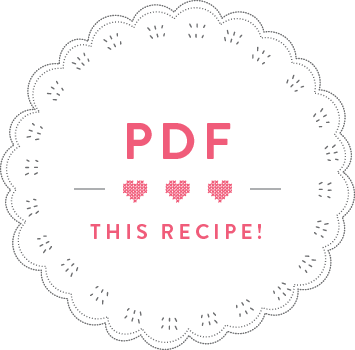 Fortunately, my Chinese friends Kenny and Sophie are masters at making them, and they have invited me to many of their dumpling cook-offs, where they’d teach me how to make and fold the delicate dough. 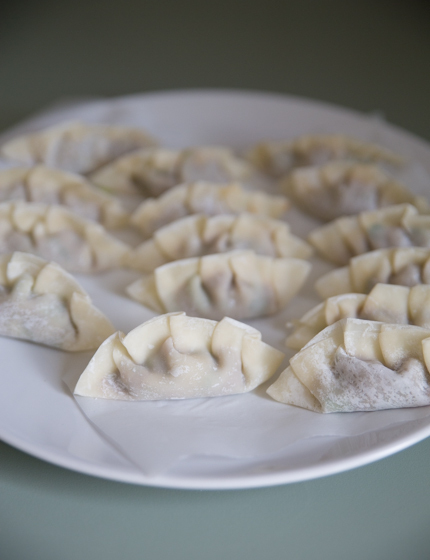 Still, I have to admit that I find it way too hard and labour intensive to make my own dumpling dough, so I just use frozen dumpling wrappers. 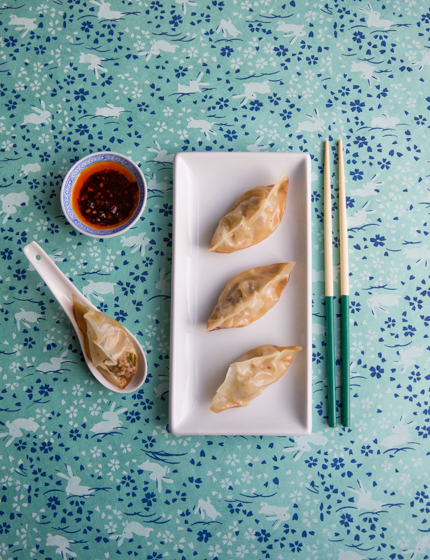 A big thanks to Kenny for sharing the recipe for this delicious dumpling filling. I made this recipe in the Chinese Food episode of my show, you can watch it here. Finely chop the chives and put into a bowl with all the other ingredients, except the wonton wrappers. Stir until everything has come together and become a homogenous mass. 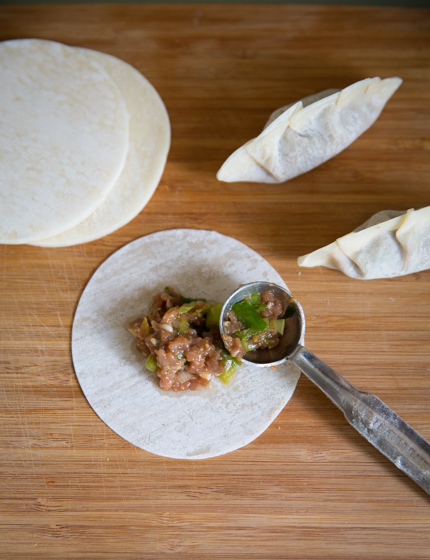 Put a heaped teaspoon of the pork mixture in the middle of a wonton wrapper. Dip your index finger into a small bowl of water, and moisten the edges of the wonton wrapper, so that a half circle is wet. Fold the wrapper over to enclose filling. Hold in both hands and, starting at one end, pleat the edges by making small overlapping folds, pressing to seal as you go. 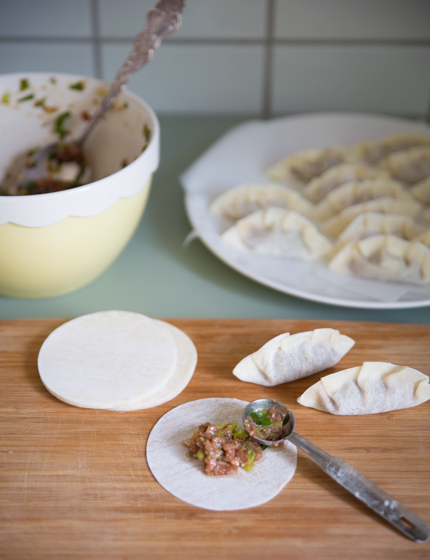 Transfer each finished dumpling onto a floured tray until you have stuffed all the dumplings in this way. To steam: cut out a piece of baking paper to fit inside of a bamboo steamer. Place some dumplings flat side down onto the baking paper. Put the bamboo steamer into a large wok over a high heat. Pour some boiling water into the bottom of the wok – it’s important that the water level is lower than the platform on which the dumplings sit, so that the dumplings are steamed and not boiled. Place the lid onto the bamboo steamer and steam for 7 minutes. Repeat with the remaining dumplings. Serve with Chinese chili oil.